If you’re serious about Nerf, you already know that you will need an assault rifle in your collection in order to play serious Nerf games. They’re generally lightweight, reliable, and are able to shoot bullets at a very rapid speed. Before you purchase your first assault rifle, however, take a look at our buyer’s guide and some of our suggestions to get an idea of what you should be looking for. Speed is both a good thing and a bad thing to have during a Nerf battle. For example, let’s imagine that you have run into an enemy. The person who is quicker to shoot their bullets is going to be the winner, and an assault rifle will help you be the one to achieve this. On the other hand, let’s imagine that you are trying to shoot a target on the other end of the field. Unfortunately, your rapid fire gun has just run out of ammo after a particularly harrowing encounter. If your gun is difficult to reload, you are in a position where you can easily be attacked and you will not be able to defend yourself unless you have another weapon at the ready. Search for an assault rifle that has either a large ammo capacity and a rapid fire rate or a smaller ammo capacity and a rapid fire rate that can be controlled. This will prevent you from wasting ammo that you don’t have or spending all of your time reloading rather than playing. If your assault rifle can rapidly launch bullets but can only do so at a range of about 5 feet, it’s of no use to you. Make sure that your assault rifle meets the minimum range of at least 75 feet or more. This will help you attack opponents both near and far in almost any environment. Even if you suspect that you won’t need to use your gun for long-range attacks, it’s still recommended that you purchase a blaster that is supposed to reach long distances. Some blasters do not ever reach their maximum length. However, the power needed to launch a dart that distance will still be there and you will need it in the event that the range isn’t met. Some assault rifles are monstrous due to the number of features on the gun and the type of batteries they require in order to operate them. If you can handle heavier guns without getting tired during a game, you can skip this section. If you can’t handle weight as much, make sure that you purchase an assault rifle that you will be able to carry for long periods of time without getting tired. Some guns will even offer shoulder supports, straps, and handles to help you better support the weight of the gun. Look for these features if you insist on getting a heavier assault rifle. As mentioned above, ammo capacity is an extremely important feature in an assault rifle. Rapid fire weapons are not very helpful if you can only hold six bullets at a time and need to reload your weapon by hand once you’ve run out of bullets. Seek out an assault rifle that either has a large drum or comes with its own ammo clip. While ammo clips do have limits, they can be prepared prior to battling and are quicker to reload. A large ammo drum is also useful because it will provide you with the ammo capacity you need and can usually be reloaded by hand quickly. I know of no semi-automatic gun that requires you to manually reload your bullets into a barrel, so finding an assault rifle that can do the above shouldn’t be too much of an issue. Accessories could make or break your chances of winning a Nerf battle. If the only things you have for your gun are the accessories that it came with, which probably was next to nothing, you are going to have a difficult time doing simple things such as aiming and reloading. Look for a gun that is compatible with most of the Nerf accessories on the market as well as third-party accessories. Having scopes, extra ammo clips, and storage stocks can be a great deal of help to you in the midst of a battle. The Nerf Modulus Regulator Blaster is one of the most unique assault rifles that Nerf has to offer. This blaster allows you to choose between three different firing methods. The first firing method gives you the option to fire single shots rather than rapid firing your bullets. The second option is called burst-fire and allows you to shoot several bullets at once. The final option is called continuous-fire and allows you to rapid fire all of your bullets at once. Along with this feature, the blaster comes with a variety of accessories including two detachable scopes, a storage stock, a swivel handle to help you grip the gun, and two dart clips that can hold up to 12 darts each. This gun is a little more expensive than others at around $60. There are very few reported problems with this gun. However, one thing that should be mentioned is that it does take four C batteries in order to operate. 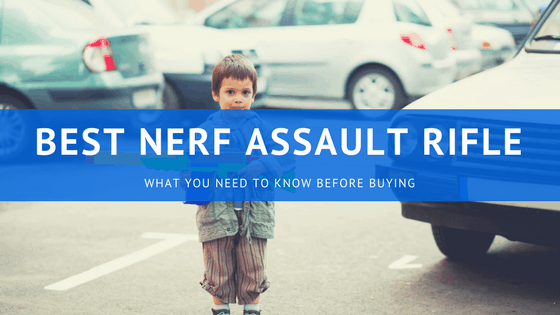 This could become expensive down the road if you frequently use your Nerf guns. If you don’t mind the batteries, though, then this is a great gun for you. 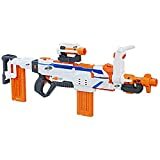 The Nerf N-Strike Elite HyperFire Blaster is a great option for those who want an assault rifle that is uncomplicated and easy to use. 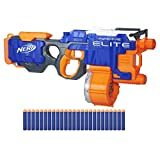 The Nerf N-Strike Elite HyperFire Blaster uses a bullet drum that can hold up to 25 foam darts that can be launched up to 90 feet, and is able to fire darts at a rate of five darts per second when the gun is running on fresh batteries. This model can be found online for around $35. This gun has two obvious downsides. The first is that it requires four D batteries to operate and it drains them fairly fast, which means you will have to be investing more money in the gun down the road. The second downside is that the gun shoots bullets quickly and will empty the drum within seconds. You may have to invest in additional drums if you intend to use this gun as your main blaster for Nerf wars. However, this gun doesn’t have any apparent design flaws and is a good assault rifle for both experienced and inexperienced Nerf players. 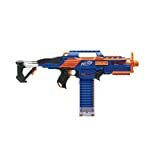 For those of you who need a lighter assault rifle than the ones previously mentioned on this list, you should consider purchasing the Nerf N-Strike Elite Rapidstrike CS-18 Blaster. The Nerf N-Strike Elite Rapidstrike CS-18 Blaster comes with a clear ammo clip that can hold up to 18 foam darts, is capable of shooting darts up to 75 feet, and has a collapsable stock that can increase or decrease the length of the gun. This one is on the higher end of the price spectrum and can be found for about $65. Jamming has been known to occur with this blaster, especially if you try to shoot it without first holding down the acceleration trigger. This model also needs four C batteries to function. However, if you are careful with the gun and you don’t mind buying batteries, this gun is definitely one that you will want to think about buying. The Nerf Rival Khaos MXVI-4000 Blaster is for those who are serious about Nerf gaming and who do not mind a major change in ammunition. 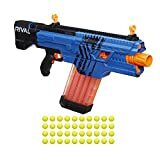 This assault rifle uses high-impact foam ball rounds rather than foam bullets, has a magazine that is capable of holding up to 40 of these foam ball rounds, and is capable of firing these rounds at a speed of 100 feet per second. You can find this model online for around $56, which is a pretty decent price considering the gun’s quality. This gun performs well and = does not appear to have any issues with functionality. 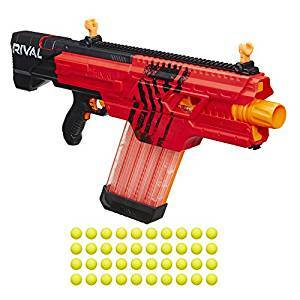 However, due to its size, speed, and its need for six D batteries, this is not a gun that is recommended for children; however, if you are considering purchasing it for an adult who is serious about Nerf battles and performance, this is the gun you should buy. The Nerf Doomlands Impact Zone Desolator Blaster is great for those who want a simple assault rifle that requires little extra work to operate it. 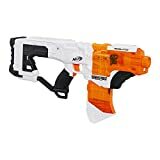 The Nerf Doomlands Impact Zone Desolator Blaster has a cool arctic design, comes with its own custom darts that match the gun’s exterior design, and has a transparent ammo clip that shows you when you have run out of ammo. You will be able to find this blaster for about $30 online. There is virtually nothing wrong with this gun. The only problem that one could think of would be the fact that it takes four AA batteries, which can be seen as an improvement compared to some of the other guns on this list. If you just want an assault rifle that works well, choose the Nerf Doomlands Impact Zone Desolator Blaster. Out of these five blasters, we highly recommend that you purchase the Nerf Rival Khaos MXVI-4000 Blaster. Despite its price, it is a very high-quality gun that will be helpful to you in almost any setting and will last a while with its magazines. If you need a more budget-friendly option, you should purchase the Nerf Doomlands Impact Zone Desolator Blaster instead. If you have seen any blasters on here that you would like to purchase, you can do so by clicking on the links below.